Can you help us to restore this fine old Public Works building constructed 1897? Our aim is to preserve it so it can be used by community groups and the local community. In 1896 the Victorian Government decided to set up a new explosives reserve at Altona on the coast of Port Phillip Bay. The government had purchased the land from the Chirnside family of Werribee Park to set up the reserve with explosives storage bunkers in a remote area. A new substantial brick residence was built by the Colonial Public Works Department for the Keeper of the Explosives Reserve and his family. At that time there were only about 50 people living in the Altona area. The site for storing explosives needed to be a long way from suburbia in case of any accidental explosions. The reserve operated from 1901 to 1962. Luckily, or with good care there was never an accidental explosion at the site. Today the Explosives Reserve is 16 hectares of salt marsh and ancient sand dunes with high conservation values and rare species. It remains crown land and the whole area has been nominated for the Victorian State Heritage Register. The Keepers Quarters residence is already locally heritage listed by Hobsons Bay City Council. Council conservation rangers take visitors on interpretation walks in the reserve to learn about local native plants animals and geology. The Keepers Quarters is a very solid brick house of generous proportions but now it desperately needs renovation, repairs and repainting. The house sits in a very large heritage garden with mature exotic trees and recently restored orchard and vegetable garden. Because of the building’s neglect a Friends of the Keepers Quarters group has been set up with skilled volunteers. The group started renovation, restoration and conservation work in June 2015. The work was able to begin thanks to donations from local clubs, groups, families and National Trust members. Our volunteers are very skilled. Some of them belong to the Hobsons Bay Men’s Shed. Members of other groups, such as the Truganina Explosives Reserve Preservation Society, Hobsons Bay Arts Society and Altona Rotary also volunteer. We are lucky to have local residents whose families lived in the Keepers Quarters and who support the project of restoration. About 18 years ago the local Altona/Williamstown community and Inner West National Trust branch worked hard to save the Reserve from development. Now the next stage begins to conserve and protect the Keepers Quarters. If repaired and restored this building could continue on for hundreds of years. It is already 118 years old! When restored it will become an important community asset and several local community groups are keen to use the building for regular activities and special events. BUT in it’s current condition that is not possible. The kitchen is very old and does not even have any power points! Our volunteers have started work, we have purchased some materials with our limited funds but they are almost running out. Can you help us with a contribution? If you are the type of person who loves history and heritage architecture you may be interested in giving a donation. We would welcome you to come to our Open Days on the first Sunday of the month from 1.00 to 3.00 pm to have a look through the Keepers Quarters and to have a Ranger guided tour of the Reserve. In the future we plan to give access to school groups for conservation studies and to learn about the history of the house and reserve. Local art groups would like to have classes and exhibitions. Other local groups will be able to use the KQ for parties, meetings and events. 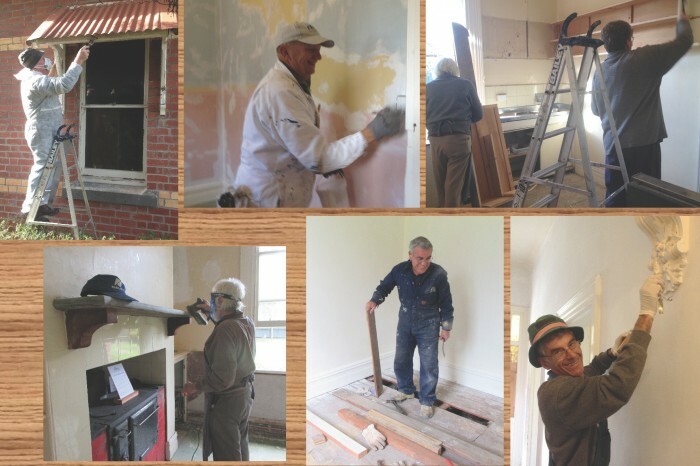 We are a group of oldies with practical skills in building and restoration, we have expert advice from National Trust members and we love to restore a historic place for others to enjoy. We enjoy the project. Join us as we lovingly restore the historic (1897) Keepers Quarters residence at the Truganina Explosives Reserve in Altona, Victoria. We want this historic building to be available for community use.